Upon first launch, Audio Headlines offers up a pre-selected set of news feeds from which it can read, though you can remove those you find uninteresting and add your own. Audio Headlines also supports Twitter, just give it a Twitter user or search term and it will read out the posts from that account. It won't read your entire Twitter stream out loud, but we all know there are a handful of accounts you're more interested in anyway. Once you've got everything set how you want it, the main Audio Headlines interface is a mix of dark grays and blacks with white text and blue buttons that say "Start Reading!" over columns of headlines and tweets. Tap that and Audio Headlines does that, it starts reading the headlines out loud. And just the headlines, despite our wishes that it read more than just the headlines it doesn't delve deeper into your RSS feed to find the text of the article. But having an overview of what's going on isn't a bad thing. 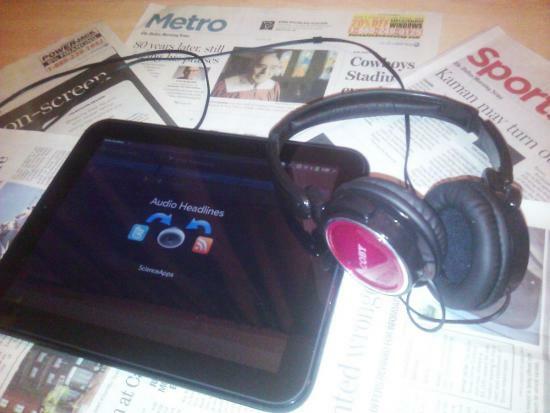 Audio Headlines includes the standard set of sharing mechanisms for the headlines and Tweets, including over email or using the Messaging app. You can also take a headline and open it up in the defautl browser or Advanced Browser (Science Apps, the developer of Audio Headlines also built the webOS app builder). Reading-wise, Audio Headlines allows you to select different languages for your feeds, and we're not going to lie, hearing it in French was fun, if not completely incomprehensible. The voice used is a pretty robotic generic female, nothing special, and certainly no Siri. As pointed out earlier, our primary pain point with Audio Headlines is that the app doesn't read the articles themselves, just the headlines. 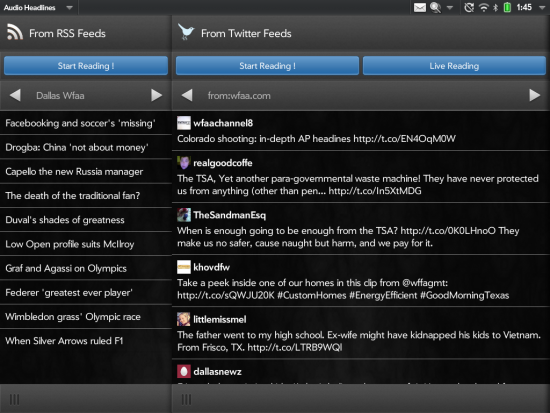 That, coupled with reading of our actual Twitter feed could make the app into a must-have for us. But alas, it doesn't support those features, but it's free, so what do we care? Whether reading is difficult for you, or you just prefer to get your news in spoken nuggets while your eyes are occupied elsewhere, Audio Headlines is the app for you.